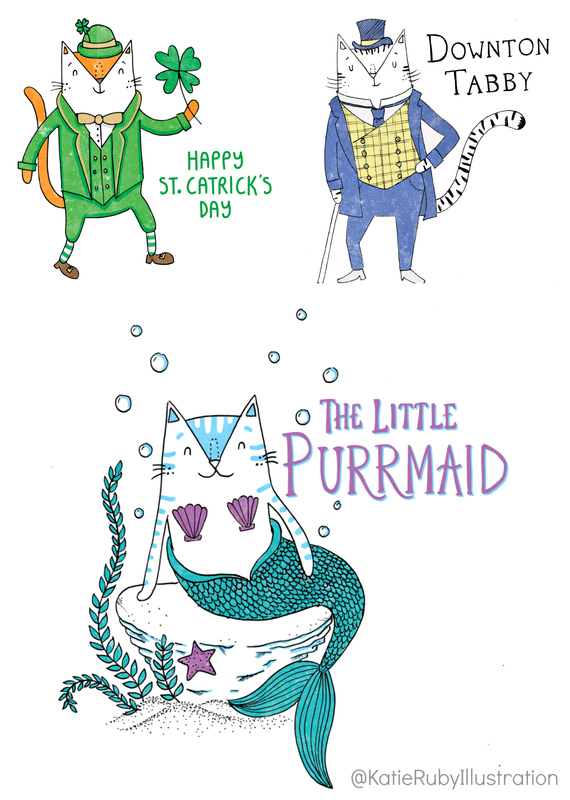 The Punderful World Of Cats is a whimsical series of pun-filled kitty illustrations by Katie Ruby Miller . They are so magical and yet relatable, I can envision them on t-shirts and other merch for cat lovers of any age from 2 to 92. It’s always a thrill to discover and then share something as enchanting as this art work. Tell us in a comment which ones you like best. Katie Ruby, a U.K. based artist/designer gathers inspurration from pop culture, film, TV, books, music and artists and guaranteed to brings smiles. For those of us immersed in catspeak where perfect becomes purrfect, the cat puns are delightfully purrfect. When I discovered Katie’s brilliant work months ago, I had to reach out and we’ve developed a simpatico email friendship. I encourage supporting indie artists. The most talented artists are often shy and deserve nurturing especially since our culture thrives on the latest viral video and in your face marketing, leaving the less pushy creatives in the dust. Only a true cat lover could create a fantasy kitty punderland as Katie. 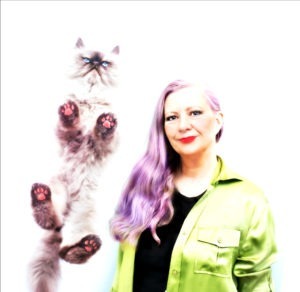 She lived for a time with two cats on a narrow boat (a river barge houseboat) and began the funny punny cat series The Punderful World of Cats as a break from her day job at a greeting card company. All the cat illustrations regardless of gender are based on a character named Furgus, a gender bender with a large “M” meow head. If he were an actor, he’d be a shoe-in for a Bafta or Oscar. Let’s see some of his starring roles, shall we? 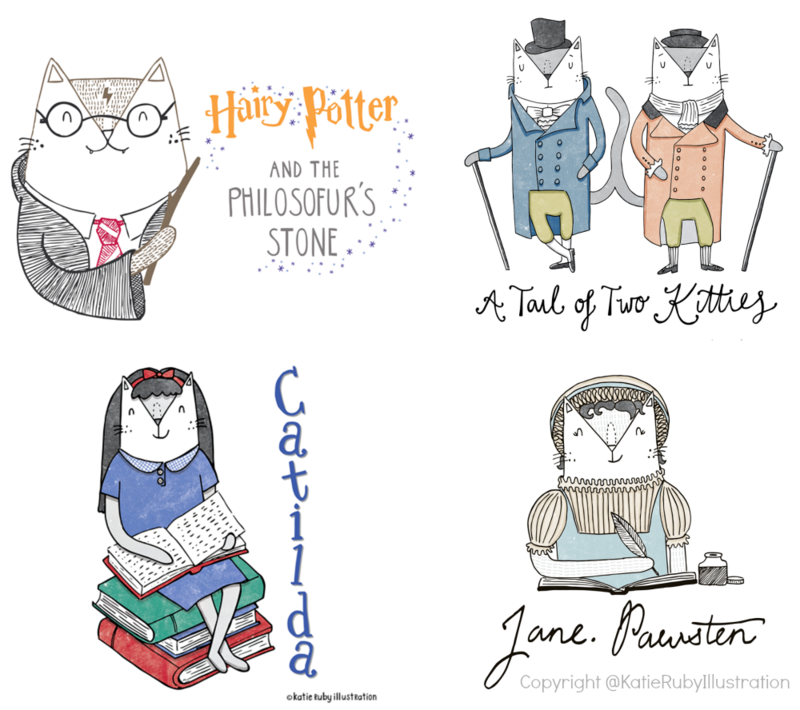 For those who enjoy cats with a literary bent. Her latest one is William Shakespurr as Macbeth but the ink is still wet. You can see it on Instagram @KatieRubyIllustration Ditto her very first gif version based on the Powerpuff Girls. From legendary artists to legends, there is a pun for all. 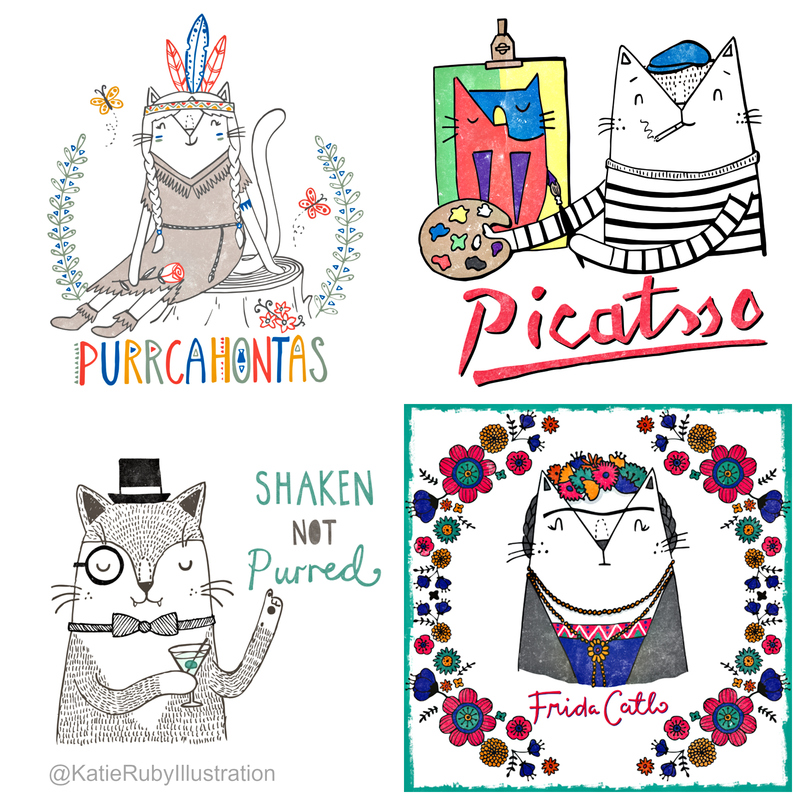 Check out Katie Ruby’s charming website, follow her on Instagram or Facebook for the latest news and artwork. All illustrations are copyright and published with permission. I would like to thnkx for the efforts you have put in writing this blog. I’m hoping the same high-grade web site post from you in the upcoming as well. Actually your creative writing abilities has encouraged me to get my own site now. Actually the blogging is spreading its wings rapidly. Your write up is a good example of it. The little Purrmaid is SO adorable. I love these. HA! Katie is so talented! We love her illustrations. We’re going to go check out her website, insta and facebook now! These are fantastic! They’re all so good it’s hard to pick a favorite, but we really like Harry Potter and Star Trek. Oh, that’s a good new word! Those made us giggle with glee! Its im-purrs-able to choose our fur-furate! Petcretary said she would like to take them all and put them in her ‘purrs’ to take out and giggle at when she needs some upurr-lifting! Those are fun, I like the Star Trek one. These are all SO fabulous! We can’t pick a favorite. Shaken not purred . . . what a hoot! PURRRRRRRRFECT!!!!! This is so creative and fun! We would like to get a Cativity Book! That is a super cool idea! We just adore creative and talented people of all kinds! Some of the ones you showed definitely gave us a chuckle. I LOVE her art. I have been following her for a while. Nellie has not been visiting me, though I have dreamed about her a few times. I expect she is gathering her strength. She was quite spent. Strangely, Licorice (my heart cat who passed 7 years ago), has been with me through it all. Love these! 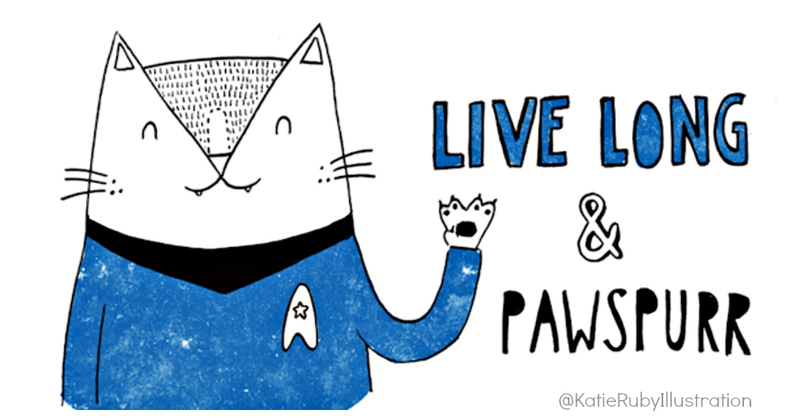 I’ve liked her FB page already, and anyone who puts cats in spaceships is a person whom I LIKE! Awesome! Agreed about cats in spaceships. You’d love the Space Cat books by Ruthven Todd which where written in the ’50s. 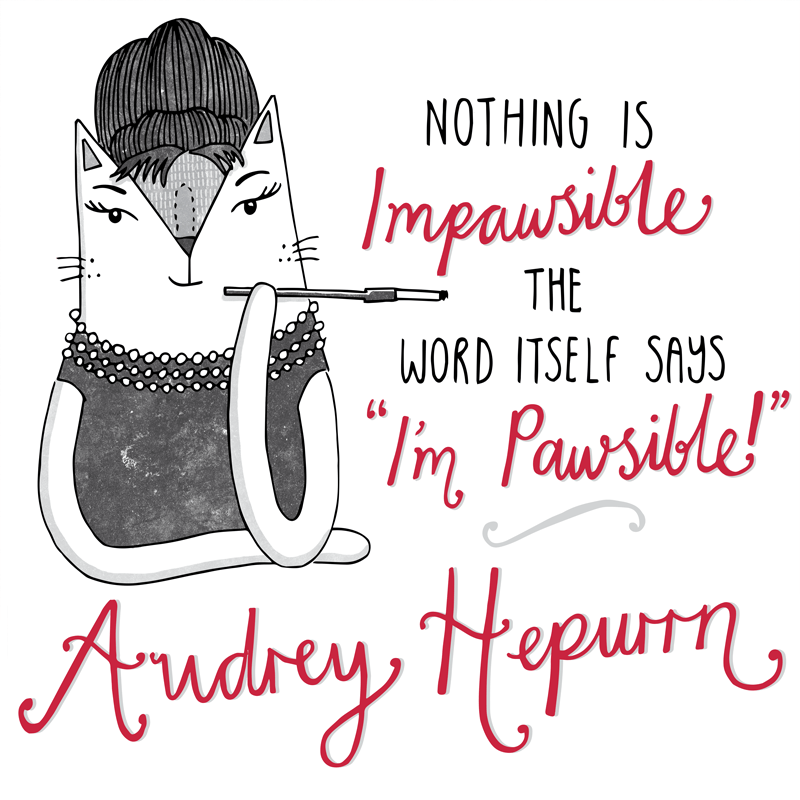 My human has always been partial to Audrey Hepburn’s quote.